Camel, the beast of the desert, has been the favourite ride of the people since time immemorial. Giving you a feel of the ethnic lifestyle of the people of Rajasthan, we provide exclusive Rajasthan Desert Safari at extremely attractive packages in affordable charges. The Rajasthan Camel Safari Tour that we offer gives you the ultimate feeling of being in this ethnic place. We have become a synonym to comfort and pleasure for our Camel Safari Tour in Rajasthan. Safari is the best way to explore and experience the adrenaline rushing excitement of the wildlife in Rajasthan. The sprawling and wide stretched natural habitat of Rajasthan can be discovered by various safaris made available by us such as Jeep Safari, Horse Safari, Tiger Safari, Bird Safari and Camel Safari. 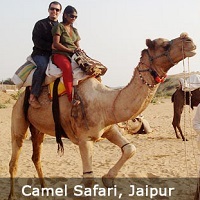 Camel Safari is one of the most popular medium for the tourist to enjoy the beauty of Rajasthan. But for this, one has to be little adventurous in nature as it includes balancing of the camel and getting used to its movement. The breathtaking experience of the Thar Desert is something you would not forget for your lifetime. Ranthambhore National Park in Rajasthan is famous for offering natural habitat to the large number of tiger. Spotting tigers in their natural condition is a site to reckon. Ranthambhor National Park offers this wonderful opportunity to experience first hand. Tiger safari is exclusively availed here. In addition to this, you can also track down numbers of other wild animals like Sloth Bear, Wild Boar, Chinkara, Porcupines and Jackals, Leopard, Jungle Cat, Marsh Crocodile, Sambhar, Chital, Nilgai, Gazzelle, Boars, Mongoose, Indian Hare, Monitor Lizards and variety of birds. Sariska Tiger Sanctuary is located in the picturesque valley of the Aravali. It is yet another wildlife park in the thick and lush wood reservoir of Rajasthan. It is known to have the home of rare breeds Of Tigers, Leopard, Sambhar, Nilgai, Wild Dog, and Chinkaras. Bird watcher and lovers have havens in the form of Bharatpur Bird Sanctuary at Rajasthan. It is one of the most acclaimed bird sanctuaries of the world. It is the breeding place of not only the aboriginal birdsâ�� species but also a huge number of alien migratory birds for Central Asia, Afghanistan as well as Tibet. The confluence of Siberian Cranes from Arctic, Graylag Geese from Siberia and bar headed Geese from China offer a unique experience for the bird lovers. In addition to this, you can also spot a number of other beautiful birds such as Cormorants, Spoon Bills, Storks, Egrets, Herons, Pelicans and Ibis all over the park. Camel Safari is the most preferred mode of taking a trip down the arid condition of the Thar Desert. The only thing one has to address while opting for the camel safari is to get use to the awkward movement of the camel. Camel is called the beast of desert as it is the life line of the parched condition of the desert. The camel may look lazy and aloof but it is the vital link of survival in the desert. Most of the journey in the inner parts of the desert is made on the camel back and camel carts. A saddle on the hump of the camel is used for sitting with leg astride for two persons in close proximity. Though the camel has confirmed its presence in the Rajasthan from the time immemorial, but elephant ride has its own charm and grandeur. It comes only second to the camel ride in the desert of Rajasthan. An elephant ride is such a fun one can experience only one has lived the experienced in the reality. The crest and trough movement one experience at the time of when an elephant moves is quite unrivalled. Itâ��s a great fun and a safe gateway to explore the particular destination of the state. So it is no wonder, why an elephant is considered to be the royal transportation of the kings. The majesty and grandeur it provides to the passenger is unparallel any where. The state of Rajasthan is known for it royal and chivalrous cultural heritage. It is palace of a large number of magnificent forts and palaces giving an exotic look to the region. The original inhabitants of the state are also very colorful in their disposition. The state has big population in its village. So to fully understand and enjoy what Rajasthan has to offer you, one has to go for a village safari. Jeep Safari is the best way to explore the rural area of Rajasthan. Horse in the state of Rajasthan has always been associated with royalty as kingdoms we constructed and demolished by the Rajputans warriors on the back of the horse with blood smeared swords on their horses. Popularly known as the â��Land of Kingsâ�� the place has been the home of fearless warriors, gorgeous women. It has huge number of royal forts, palaces and temples which can be very well explored and enjoyed on the back of the horse. Horses were highly priced and Rajputs warriors were could not compromise on any thing related to horse. Even greater care was also taken for the clean and pure lineage of the horses in the royal past of Rajasthan. The Jeep Safari in the desert of Rajasthan is the best way to give you thrill and excitement of exploring the exotic location of the state. The enjoyment is of unparalleled experience. It is the fastest and the most enjoyable way to tour the colorful Thar Desert. This give you a unique experience to roam around the hidden mystery of desert landscapes, little vibrant colorful Rajasthani village. The deserted ruins of royal forts, temples, wildlife, tribal population every thing can be explored by jeep safari in the most efficient and hassle free manner.